The 1889 Brooklyn Bridegrooms won the American Association championship by two games over the St. Louis Browns. December 23, 1888: Al Mays and Dave Orr were purchased from the Bridegrooms by the Columbus Solons. Prior to 1889 season: Paul Radford was purchased from the Bridegrooms by the Cleveland Spiders. 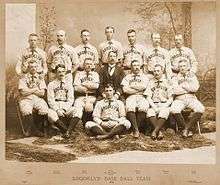 The Bridegrooms played in the 1889 World Series representing the American Association against the New York Giants, champions of the National League. The Giants won the series, 6 games to 3. This series would be the first meeting between these two historic rivals.